Now here is a little peninsula, and here is a viaduct leading over to the mainland. All right, why a duck? Why a duck, why-a no chicken? 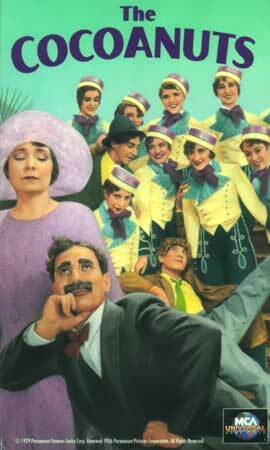 A musical comedy called I'll Say She Is was the Marx Brothers' first Broadway stage hit, most unfortunately never filmed. This was followed by The Cocoanuts, a great Broadway hit in 1925, which they then took on tour. While their third big comedy Animal Crackers was running on stage, they made the film version of The Cocoanuts. The Cocoanuts is set in Florida in the 1920s. In the early 1920s, a rush of newcomers and speculators sent land values soaring, creating the Florida Land Boom. But in 1925 the over-inflated Florida land market busted, and as if to finish things off, in September 1926 South Florida was hit by a major hurricane and accompanying tidal wave. In The Cocoanuts Groucho Marx plays hotel proprietor and land impresario Mr. Hammer — as in auctioneer's hammer. Or speaking mythically we may see him as a Hammerer of the Hopeful, a comic demigod trying to auction riches out of the sandy soil. He is hindered and helped by his brothers-in-anarchy Chico and Harpo, comrades creating chaos among the palm trees and through the hotel rooms. Zeppo as usual is a contrastingly rational assistant. "The one I've got rid of is worth three ordinary ones." The Marxes' polar opposite, the solidly ever-dignified Margaret Dumont, reprises her stage role as a wealthy dowager pursued by Groucho after his inimitable fashion. Kay Francis is excellent as the suave and slinky con-artiste and jewel-thief. The Cocoanuts includes fancy formation-dancing by the hotel's bellhop girls, romantic singing, Chico playing the piano and Harpo his harp. All fine in themselves, and allow the audience to catch our breath now and then. The musical take-off of Bizet's great opera Carmen nicely melds the music and humor. Nearly everybody on Broadway wanted to sign us up for our second show, including Ziegfeld, Dillingham .... The one guy who didn't go after us was the one guy we wanted to work for — Sam Harris. We had plenty of sketches of our own. What we wanted to do was a real show, not a corny revue. ... We decided we'd take care of the writer ourselves. He turned up backstage that night, a small fellow with a cocky manner, and introduced himself. We just stared at him. Zeppo did all the talking. ... "So you want to write us a new show, huh?" He felt the muscle on the guy's right arm and shook his head. ... Zeppo said, "Didn't Sam tell you how we do business with writers?" The guy looked puzzled, then apprehensive. Zeppo rolled up his own sleeves. In those days Zeppo had biceps like Charles Atlas. "Okay, writer, let's go," he said. "Rassle you to a fall. You write us two shows or nothing." ... We never saw him again. When he reported back, Sam ... paid the guy off, then called up George S. Kaufman, and said, "I need a big writer who can wrestle, George. How tall are you?" When George learned what Sam needed a big writer for, he said, "Are you crazy? Write a show for the Marx Brothers? I'd rather write a show for the Barbary apes!" But Sam was not perturbed. Our second Broadway hit was The Cocoanuts — music by Irving Berlin, and book by George S. Kaufman and Morrie Ryskind, staged by George S. Kaufman. The Cocoanuts is the Marx Brothers' first feature film, made not long after the addition of synchronized sound revolutionized the movie industry. Marx Brothers movies became favorites of mine while I was quite young. As I began to develop an appreciation of the Marx Brothers' artistry, Vera Howe Franson explained to me how they had built their skills during years on the vaudeville stage. When they moved into movies, the Marx Brothers began with stage successes, and some of their original movies were honed by taking preliminary versions on the road. They could gauge live audiences' reaction to the jokes and pacing. Vera saw the Marx Brothers perform The Cocoanuts live on stage. These periods of live tuning may resemble what William Shakespeare was able to do, over three centuries earlier, when as actor or prompter for his own plays he continually saw what worked and what didn't. Being a playwright so close to his audiences can only have sharpened Shakespeare's genius. Vera Franson had studied all Shakespeare's plays long before she and I first talked about the Marx Brothers, and she appreciated fast-paced plotting as well as snap-back repartee. Today success or failure is often determined much earlier in life and there is scant room for a gradual realisation of latent talents such as the Marx Brothers' numerous years on the vaudeville circuits provided. They switched from vaudeville to the legitimate stage really by chance. I'll Say She Is just bridged the gap in classification between "tab show" and full-fledged musical comedy. Once on the [legitimate, Broadway] stage, they were taken up by the cinema at a time when the techniques for making sound pictures helped to ensure that the stage shows were largely filmed as they stood. Looking at The Cocoanuts and Animal Crackers today, we have the rare experience of seeing a permanent record of the Broadway twenties and an impression of the vaudeville beyond that. Even if we find these films unamusing, we are looking at productions that were a mass delight and two of the great Broadway successes of the period. And we see four comedians making a nimble leap from the last days of vaudeville to the first days when the cinema was properly equipped to accept them. The jokes and funny set-ups come so thick and fast in The Cocoanuts, overlapping coarse or subtle sight gags, that a viewer may still be picking up new hilarity even after seeing the film multiple times. If only all the Hollywood sound films to come could be as good as The Cocoanuts.